Buoy must have a legible "R" at least two inches high, permanently affixed to it. Buoys are not required if trap is fished from a dock. Trap shall have harvesters name and address permanently affixed to it in legible letters. Traps must be pulled only during daylight hours. A Florida recreational fishing license is required to harvest stone crabs under the recreational fishing regulations. Stone crab trap specifications are the same for recreational and commercial harvesters. Trap specifications may be found in Rule 68B-13.008, Florida Administrative Code. Can both stone crab claws be harvested? 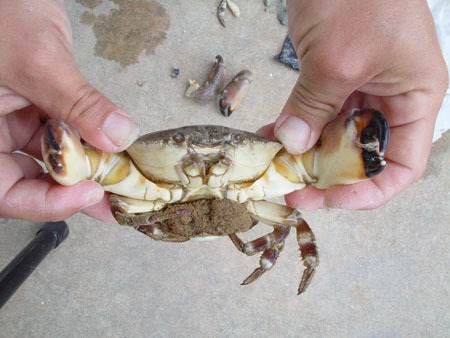 Both claws of a stone crab may be harvested lawfully if they are of legal size. Although it is currently lawful to harvest both of a stone crab's claws this practice leaves the stone crab with few alternatives to defend itself from predators. Although the crab can still obtain minimal amounts of food with no claws, having one claw (if the other one is harvested) will enable the crab to obtain greater amounts of food in a shorter amount of time. Stone crabs (like other crustaceans) have the ability to grow back their claws, but this process requires a large amount of energy in the form of food. The quicker the crab can obtain the energy required to molt and grow its lost claw, the sooner this renewable delicacy will have another claw to replace the missing claw.